The Palm OTDR (OT-8600) is a new miniature, high performance optical time domain reflectometer which is designed as fiber troubleshooter for locating fiber connector, break and imperfections for access networks. It detects event locations along the optical fiber and displays the results on a color LCD display. 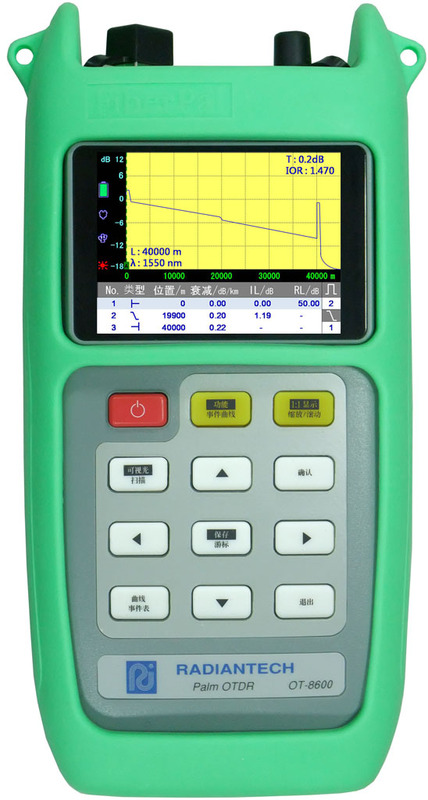 This Palm OTDR is light, reliable and easy to use, hence it is ideal for FTTX testing. The Application Software equipped is used for data analysis, processing and storage. With the USB Interface port, enabling OT-8600 to transfer test data to computer easily. 1.All specifications are subject to change without notice. 4.Tested under Easy-scan Mode with 1 km SM fiber. 5.Reflective type connection could be normal adaptive connectors, normal mechanical splice connections or high return loss fiber breakage faults. 6. Non-Reflective type connection could be fusion splice connection or excessive bending point or fiber breakage faults. 7. Up to 5000 traces with 1 GB SD memory card.